Serving up great food and spirits with a friendly laid back attitude. fashioned neighborhood watering hole that’s also serving up some great food. Grab a chrome bar stool, stare at a Yankee repeat from the night before, and begin to hear and smell the meat sizzling on the flattop. Order a 12 ounce draft in a perfectly curved pilsner glass and kick back and enjoy a few hours inside one of the greatest neighborhood hang outs on the planet. About a mile southeast of the Penn Station and the Pru Center across the Passiac River, time stands still Down Neck at Krug’s Tavern. 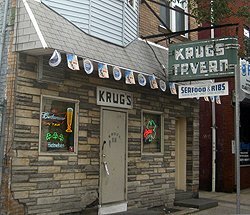 With it’s legendary local tavern style, Krugs has been situated the Ironbound section of Newark since 1938. The creation of Frank Krug has been serving up the goods for over 70 years. While most people think of the area for great Portuguese food, Krug’s and their flat top grill has been delivering incredible portions of burgers, cheesesteaks, and Italian hotdogs. But it’s the signature hot shrimp and calamari that keeps bringing ’em back time and time again. Local police, long shoreman, and firefighters who support the fabric and infrastructure of Newark continue to call Krug’s their home away from home. It doesn’t matter where you came from, so long as you’re ready to have a good time. We were lucky enough to be introduced to Krug’s by Ken McShea, a legendary retired Newark motorcycle cop #806 and former Vailsburg resident who happens to also be my father-in-law. 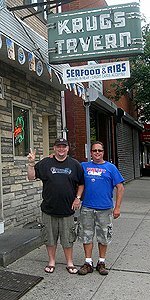 “This guy has certainly put some time in and around the inner workings of Newark and knows a few things about where to eat when Down Neck”. 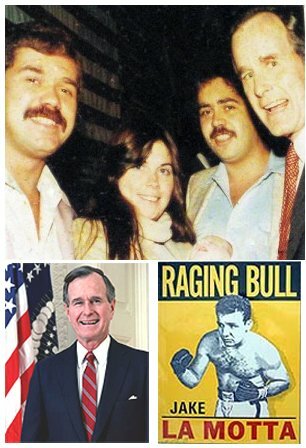 During the 1984 presidental campaign, GW Bush visits Krugs in Newark. Historic Krugs Tavern is run by Ellen LaMotta, her brother-in-law Frank and her sister-in-law Susan. Ellen LaMotta is the widow of Gary LaMotta, Frank Krug’s grandson. The family is related to Jake LaMotta, the middleweight champion boxer of the ‘40s and ‘50s portrayed by Robert DeNiroin the 1980 movie “Raging Bull.” The fighter has visited the bar. There’s even a photo above the bar with George H.W. Bush who made a stopover during the 1984 presidential campaign. marinara sauce; mild, medium, and hot. If you like spicy foods that your body will remember the next day, then definately try the hot. 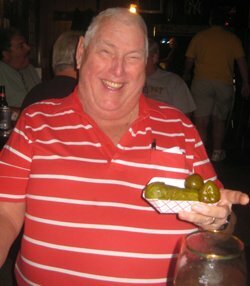 Fresh buttered bread, cold pickles and a backup glass of cold beer is recommended. Jumbo burgers, Italian hotdogs, and oversize cheesesteaks are also heavyweights on the menu. All three are big time items where the bread takes the backseat to the meat and toppings. The burger weighs in at about 12 ounces (3/4 pound), three times the wimpy McDonald’s quarter pounder. With cheese or without, it’s definitely a two hander! Retired Newark Motorcycle Legend #806 Ken McShea enjoys a few laughs whenever he’s back at Krugs. Don’t let the exterior of this place fool you. 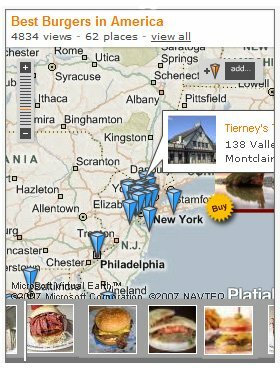 You need to dig to find this place and certainly need to know your way around Newark. But it’s also in Ironbound, south of the tracks, and you don’t need to have security detail if your testing the area for the first time. Don’t listen to the dopes from the suburbs. This is the inner city at it’s best serving great food at a great price with a down home family friendly atmosphere. Check Krugs out for lunch sometime. Just don’t be surprised if your still in the same stool six hours later ordering dinner. 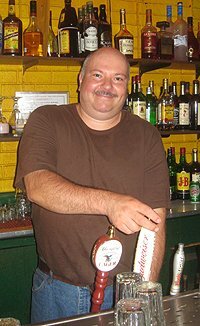 Jimmy Piontek, bartender and flat top master serves it up the way he’s done it for years. River curved to form what looked like a neck. Today, the neighborhood is sometimes referred to as “Little Portugal” owing to its large Portuguese community. The Ironbound is part of Newark’s East Ward and is directly east of Penn Station and downtown Newark, and south and west of the river. The name “Ironbound” is said to have originated from the many forges and foundries that were found in this area during the latter half of the 19th century. A half dozen tables each with four seats are available adjacent to the bar, while a back room behind the jukebox and pool table is available for events. So whether it’s the fried shrimp with spicy hot homemade marinara, the 3/4 pound burger, or just a place to take in some local flavor, nothing beats Krugs Tavern. It’s not like I like to bring a camera everywhere I go, but I felt that you had to see just how much great food you get when you’re dropping in down at Krugs. 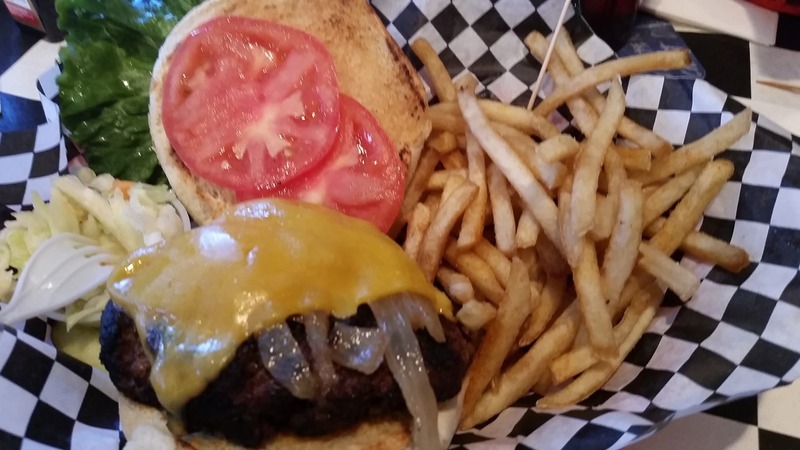 Whether it’s the italian hot dog, the hot spicy shrimp, or the 12 oz burger (see below), you’re not going to go wrong! I mean c’mon – you’re not hungry now? Krug’s Tavern has also made it on the Best Burgers in America for delivering on all fronts when pushing out the beef on a bun.